Chemistry in our life: Pi-stacking better without the aromatics? Scientists in the US have discovered that electrons confined to their double bonds can sometimes deliver stronger pi-stacking interactions than those roaming free in aromatic systems. The discovery could have a big impact on the design of receptors and supramolecular assemblies that rely on delocalised systems, they say. 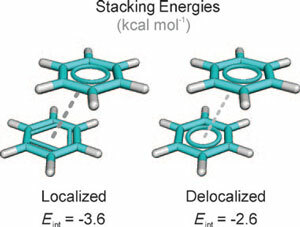 Pi-stacking interactions are usually thought of as occurring between aromatic rings, and such interactions along with anion-pi and cation-pi interactions are often collectively referred to as 'aromatic interactions'. Wheeler explains that nature seems to favour pi-stacking interactions involving aromatic systems for example in aromatic amino acid interactions and DNA base stacking. However, he and his team believe this to be due more to the stability of the monomers, rather than strong pi-stacking interactions. 'Although mimicking nature is often fruitful, in this case it might be that the natural prevalence of aromatic rings in pi-stacking interactions is a side-effect of other factors, not a driving force itself,' he says. By analysing computed stacking energies that the team calculated for a range of pi-stacking systems, they concluded that stacking interactions involving non-aromatic polyenes are as favourable as, if not more favourable than, interactions among equivalent aromatic species. 'Employing such non-aromatic polyenes in supramolecular applications should be advantageous,' Wheeler says. 'The Wheeler paper is a major step forward in understanding,' says Paul von Rague' Schleyer, an expert in computational studies of aromaticity at the University of Georgia in Athens, US. 'It builds on and extends our work on stacking interactions of three to nine membered rings2, which anticipated the present findings and conclusions at least to some degree,' he adds. David Sherrill, a leader in the field of computational studies of stacking interactions, from the Georgia Institute of Technology in Atlanta, US, says: 'What this paper seems to show is that in some cases pi-pi interactions can be enhanced by breaking the aromaticity to yield localised pi orbitals. This is a big surprise, and I think most of the community would not have expected that result,' he says. 'It is commonly the case that when one is making some supramolecular systems, the presence of an aromatic interaction is considered the favourable recognition element, and it still is. But now, I think we can broaden our view to look at a wider variety of these recognition elements,' he adds. I have found your blog, which I really like it. Enjoyed to read your posts, hope you will continue it. I am much pleased with your work. You put very helpful information. I just want to thank you for sharing your information and your blog is simple but attractive. The biggest advantages of Chemist. But guidemytreatment is providing the drugs at low cost and high quality. Then you have to wait until the ordered medications are delivered to your place. Here you can find more Organic Chemical Synthesis, BOC Sciences provides a wide variety of custom services which range from bulk compounds to specialty species in the pharmaceutical, agrochemical, and biotechnology industries. please visit http://www.bocsci.com. chemical synthesis drug design drug development.